(CNN)”I can’t breathe.” These were the final words uttered by Jamal Khashoggi after he was set upon by a Saudi hit squad at the country’s consulate in Istanbul, according to a source briefed on the investigation into the killing of the Washington Post columnist.The source, who has read a translated transcript of an audio recording of Khashoggi’s painful last moments, said it was clear that the killing on October 2 was no botched rendition attempt, but the execution of a premeditated plan to murder the journalist.During the course of the gruesome scene, the source describes Khashoggi struggling against a group of people determined to kill him.”I can’t breathe,” Khashoggi says.”I can’t breathe.””I can’t breathe.”The transcript notes the sounds of Khashoggi’s body being dismembered by a saw, as the alleged perpetrators are advised to listen to music to block out the sound.And, according to the source, the transcript suggests that a series of phone calls are made, briefing them on progress. Turkish officials believe the calls were made to senior figures in Riyadh.Some of the details in the transcript seen by CNN’s source have emerged in previous reports of the recording’s content. But this is the fullest account of the transcript that has so far been published. Jamal Khashoggi’s private WhatsApp messages may offer new clues to killingIt is likely to increase pressure on the Trump administration, which has been determined to separate Crown Prince Mohammed bin Salman from the murder, and sought to frame the issue as a binary choice between supporting or cutting off a key partner in the Middle East. US President Donald Trump has been at odds with the CIA, which, sources say, has concluded bin Salman personally ordered the killing.The revelations also threaten to undermine a key plank of an initial Saudi explanation for Khashoggi’s death, that it was a rogue operation that went horribly wrong. The office of one US senator, who has received a briefing on the investigation by CIA Director Gina Haspel, told CNN that the source’s recollections of the transcript are “consistent” with that briefing.CNN asked Saudi officials to comment on the contents of the transcript as described by the source, and to provide comment from those named in it. A Saudi official said: “The relevant Saudi security officials have reviewed the transcript and tape materials through Turkish security channels and nowhere in them is there any reference or indication of a call being made.””If there is additional information Turkish authorities have that we are unaware of, we would welcome it being officially handed over to us for review, which we have requested numerous times and are still requesting. And, up until now; we have not received anything.” The official did not address the transcript’s characterization of the scene inside the Saudi consulate, nor Khashoggi’s last words. A security camera image shows Khashoggi entering the Saudi Consulate in Istanbul. The transcript begins at the moment Khashoggi enters the Saudi consulate in a quiet residential district of Istanbul at lunchtime on October 2.Khashoggi thought he had made a routine appointment to pick up papers that would allow him to marry his Turkish fiancée, Hatice Cengiz. But, according to the source, it dawns upon Khashoggi almost immediately that things are not going to plan, when he recognizes one of the men who meets him. Without any further dialogue, according to the source, the transcript indicates that several people set upon Khashoggi. Noises follow, and very quickly Khashoggi is fighting for air. The slow-motion disaster of Trump’s Khashoggi strategy In one version of the evolving explanations for his death, Saudi officials suggested Khashoggi was accidentally choked. But according to the transcript, CNN’s source says, the journalist’s voice can be heard above the noise, repeatedly claiming he could not breathe.Despite his desperate pleas, the last discernible words the transcript records for Khashoggi are:”I can’t breathe.”The transcript notes more noises, and several more voices.One of those voices is identified on the transcript by Turkish authorities as belonging to Dr. Salah Muhammad al-Tubaiqi, the head of forensic medicine at Saudi Arabia’s Interior Ministry, the source says. Tubaiqi is noted giving some advice to other people in the room, apparently to help them deal with the appalling task.”Put your earphones in, or listen to music like me.”During the scene, the transcript notes at least three phone calls placed by Mutreb. The transcript does not specify the moment Khashoggi dies.According to the source, the transcript suggests Mutreb is updating someone, whom Turkish officials say was in Riyadh, with almost step-by-step details of what is taking place.”Tell yours, the thing is done, it’s done.”The word “yours” is taken by CNN’s source to refer to a superior, or boss. The transcript has been circulated to key Turkish and Saudi allies, including those in Europe, but only the United States and Saudi Arabia have received the recording itself, the source believes. The working assumption among those allies is that Mutreb was talking to Saud al-Qahtani, bin Salman’s closest aide, the source said. Saudi officials say al-Qahtani has been removed from his former position as media chief to the crown prince.The transcript only records Mutreb’s side of the conversation. Without a recording of that call, or more details of which number was called, further conclusions based on the transcript alone cannot be made. 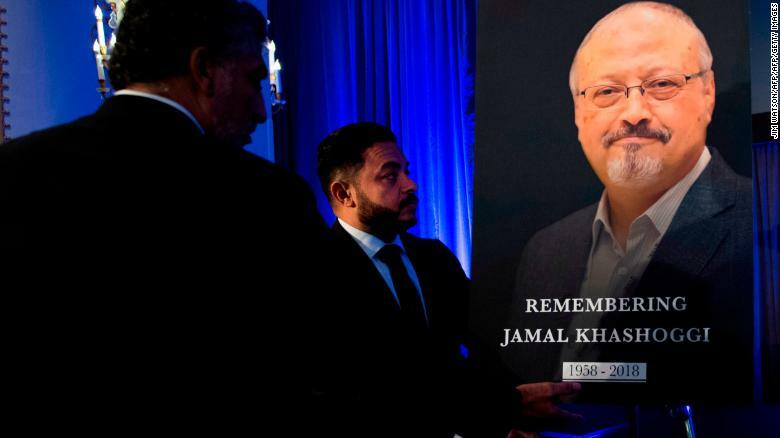 A portrait of Jamal Khashoggi during a remembrance ceremony for him in Washington on November 2. A source close to the Saudi investigation into Khashoggi’s killing told CNN that Mutreb and Tubaiqi deny making any phone calls.CNN has previously reported how Mutreb, Tubaiqi and 13 other Saudis arrived in Istanbul by private charter jets and commercial aircraft on the day of and the days leading up to Khashoggi’s murder.Turkish surveillance video records the 15-man hit team arriving at the consulate shortly before Khashoggi, and departing a few hours later. A body double of Khashoggi dressed in Khashoggi’s clothes is seen on CCTV leaving by the back door. It is clear from the transcript of the phone conversation that the calls do not describe a terrible situation gone awry, or explain an unexpected set of circumstances, the source says. Instead, the caller appears simply to be informing someone of what is going on. Hardly, the source says, the actions of a panicked ringleader, but more the description of a situation going entirely according to plan. The transcript is relatively short, given the time span it describes, the source told CNN. There is not much dialogue; certainly no hint of a conversation about why Khashoggi should go “back,” and no suggestion either, as advanced at one point by Saudi officials, that he had been drugged by the hit team. There is nothing in this transcript that the source could describe as a “smoking gun” — a snippet of conversation or phone call that directly ties bin Salman to the so-called hit team, and to Khashoggi’s murder. Graham on Khashoggi: Crown Prince ‘complicit’ 02:00But the lasting conclusion the source drew from the transcript is that Khashoggi’s killing was a planned assassination by an organized team that carried out its job with ruthless efficiency, keeping someone in Riyadh informed at each step.While the transcript provides no smoking gun directly tying Crown Prince Mohammed bin Salman to the killing, it seems to echo Sen. Lindsey Graham’s sentiments after hearing the CIA’s assessment of Khashoggi’s killing. Graham, who was among a group of senators to receive a classified briefing on the Khashoggi case, said earlier this week that he agreed with the conclusions of the US security services that bin Salman was implicated in the case.”There’s not a smoking gun, there’s a smoking saw,” he said.